The QVC Dental Port Kennedy team focuses on giving you a positive, comfortable experience at each of your visits to our practice. 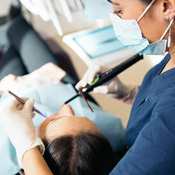 Many services are available to you and your entire family, and you can rest assured that we’ll discuss all possible treatment options with you, deciding together what is best for your situation.When necessary, we offer root canal treatment to save your tooth from needing to be extracted. We want your dental care to be as stress-free and painless as possible. We offer a range of sedation options and will only proceed with treatment once you agree and are feeling completely comfortable. If your case is particularly complex, we work with an endodontist that we can refer you to. Schedule your appointment by phone or email today! If you’re in pain, we’ll see you as an emergency case as quickly as possible.